Essie Good To Go | Jen Nails It! This is my second polish from the Skyfall Collection by OPI. 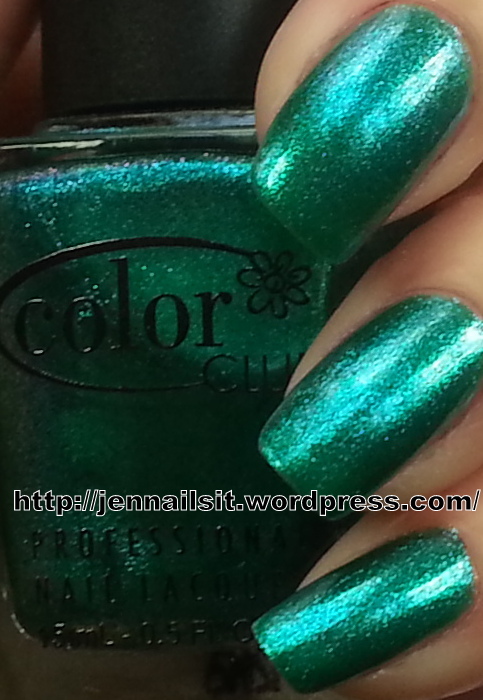 “On Her Majesty’s Secret Service” is described as a misty green pewter colour. If you remember, I wasn’t very impressed with my last polish from this collection “Casino Royale” but I’m going to have to eat my words now lol. I really like this colour. It’s a beautiful shade of pewter with a hint of a very classy green, only visible in certain lighting conditions. The consistency is a little thin and I had to apply three coats to get a decent coverage but it dried quite fast so that’s not a big problem. I’ve used it here with Essie First Base and Essie Good To Go base and top coats. “On Her Majesty’s Secret Service” definitely gets a thumbs up from me, it’s one of my favourite metallic colours ever! Today I’ve tried another polish from Butter London’s Autumn/Winter 2012 Collection. As you can see, this polish has lots of depth and interest. It’s certainly much nicer on the nail than in the bottle. I found myself just staring at it for ages! Here I’ve used three thin coats of Dodgy Barnett along with Essie First Base and Essie Good To Go base and top coats. “Don’t Talk Bach To Me” is from the Germany Collection by OPI for Autumn 2012. This is a very unusual colour which is described as a lime yellow. This colour was one of the first I went for in the Germany Collection but I still can’t make up my mind about it in the flesh. It applies really evenly and dries quickly. Here I’ve used it with Essie First Base and Essie Good To Go base and top coats. The problem I have with this polish is that I don’t really think that it suits my skintone. One minute I like it and then I hate it lol. What do you think? Gobsmacked is from the Butter London Autumn/Winter 2012 Collection. This is a heavily pigmented charcoal grey, glitter nail lacquer with a slightly textured finish. I love the silver micro particles in this polish, its a very sophisticated glitter. Gobsmacked applies really evenly by itself which is unusual for a glitter polish. Here I have used two coats of it with Essie First Base and Essie Good To Go base and top coats.